. 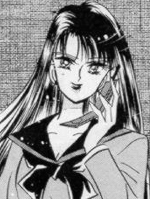 : Lunar Palace v.5 - Manga: Sailor Mars :. First Scool For Girls is a Junior High and a High Scool combined. Raye's mother had a weak heart and died when she was young. She was taken in by her grandfather on her mother's side. Raye turns 15 in Volume 8, Act 25.